As you've likely noticed, every social network seems intent on becoming a TV network these days. YouTube recently announced a slate of original programming, Twitter has live-streaming deals in place with an expanding number of broadcasters and sporting codes, Snapchat's working on episodic TV-style content to compliment their Discover material. So why the shift towards TV content? As you can in the first image, viewership of episodic TV content on YouTube has increased dramatically in recent times, underlining shifting viewer behaviors, while TV ad spend is set to be overtaken by digital this year. That's a $78 billion opportunity that social networks can tap into, if they can prove themselves as legitimate TV alternatives. And this shift is crucially important to watch for marketers, as it has the potential to open up a whole new range of opportunities for reach through social platforms - TV ad reach that's significantly more affordable and infinitely more targeted than the current options. TV remains the key place to be to maximize brand awareness and exposure, and soon, more brands might be able to utilize it, and in much more efficient ways. As such, marketers should be working to keep tabs on the latest moves on this front to measure where each platform is at with their TV efforts, and what the next stage will be. Here's a couple of recent moves worth noting on the digital TV shift. Reuters is reporting that Facebook has signed deals with Vox Media, BuzzFeed, ATTN and Group Nine Media to make shows for its soon to be expanded video effort. "Facebook is planning two tiers of video entertainment: scripted shows with episodes lasting 20 to 30 minutes, which it will own; and shorter scripted and unscripted shows with episodes lasting about 5 to 10 minutes, which Facebook will not own, according to the sources." Facebook will reportedly pay up to $250,000 for the longer programs, to which it will own the rights, while it'll pay between $10,000 and $35,000 for the short-form content and give publishers 55% of the ad revenue generated. Facebook's been working on deals to being TV-like video content for some time, and they just recently added coverage of Major League Baseball games and a new eSports content. The next phase of this shift is the expected announcement of a new, dedicated video content tab within Facebook to showcase the new material - or maybe even a new app. Facebook's also working to evolve their TV connection efforts, giving users new ways to watch Facebook TV content on their home television sets. Just like YouTube, the addition of exclusive content will help Facebook further promote its offerings and change user behavior - if your favorite show is airing only on Facebook, you'll find a way to watch it, which will then enable Facebook to keep you there with more video material. At some stage soon, you might just find yourself switching across to Facebook video like you would any other channel, a shift that would give advertisers a whole new way to reach you. While more and more people are watching video content on mobile devices, the TV set still remains the key entertainment option - if digital platforms want to truly rival traditional TV, they need to make it easy as possible for users to watch their content on their TV screens. 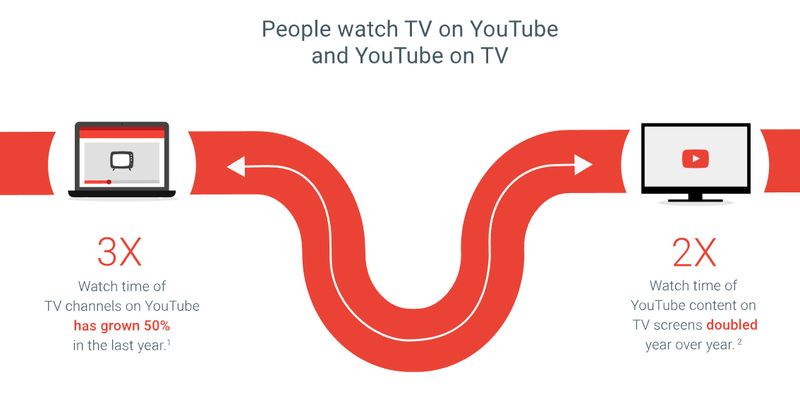 YouTube, Facebook and Twitter all have their own TV apps for this purpose, and this week, Twitter has added a new measure within their iOS app to help facilitate direct connection with Apple TV enabled screens. At the moment, the change is relatively small scale - Twitter's not made any big announcements, and it may well have been in the works for some time. But the addition could help set the stage for greater TV integration in future, enabling easier viewing of Twitter video content on your home TV set. Further emphasizing the connection between on and offline devices, Twitter has also added a slick looking new 360 globe map for Periscope broadcasts, also available through Apple TV. Both Periscope and Facebook already have map functionality built into their live-stream offerings, but this new variation takes it to another level, and again, gives you access to Twitter video content on your home TV set. It's hard to say exactly what the future of live-streaming will be, but the potential is there for it to become a much bigger consideration, if they can weed out the junk and highlight more relevant, resonant live content. The Periscope TV extension will most notably come into its own in times of major events, giving users a new way to experience what it's like on the ground. As noted, Snapchat is also moving into exclusive video content, luring creators with the appeal of reaching their Millennial-dominated audience. Fortune is reporting that Snap has signed up a range of new programs, including new shows from James Corden and Conan O'Brien, and a new daily news program from NBC (NBCUniversal, recently invested $500 million in Snap Inc.). "Snap is also working on a multi-show deal with the Discovery Network, and similar deals are said to be coming with Vice Media, ABC News, the BBC and the NFL. According to a report in Variety, Snap wants to quadruple the number of shows it has from 5 to 20." Snap faces a harder road to prominence than the other apps, and they have no TV-connection option (nor one in the works from what we've heard), but as noted, Snapchat does offer reach to the Millennial market. For Snap, it's a win, because more high quality, exclusive content will obviously draw more people to the app, and for publishers, it gives them another avenue to expand their messaging and tap into user trends. If Snapchat can maintain its hold on those audiences, it could be a significant win for all involved. As you can see, all four platforms are making moves into TV-like content, with the pay-off looming in the form of increased ad dollars. And given the usage trends, it's likely that we are going to see a significant shift on this front in coming years - it may not be hugely relevant to your business right now, but video ads, and video content, could soon be form a much bigger part of your strategy.